So far, I’ve scaped a few tanks and at the moment, I am about to start rescaping my 30l and 37l nano tanks. 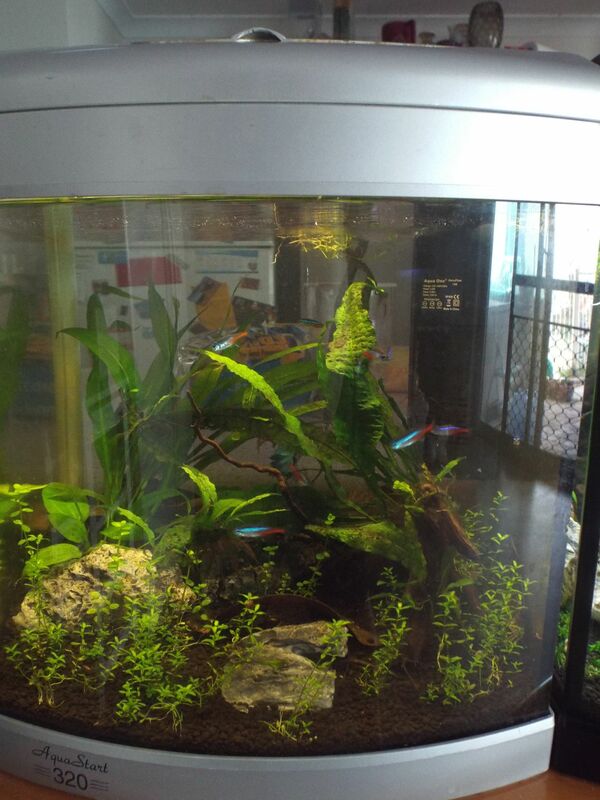 The 37l tank, the hardscape is fine, it’s just the plants that are a bother… so I am going to replant the tank and hopefully make it look much better. I am probably going to get some semi-submersed plants for the corners beside the filter and maybe make some mods to the tank so that the sump filter itself operates better. I am also about to get into doing planted vases… which are basically small aquariums which look great. 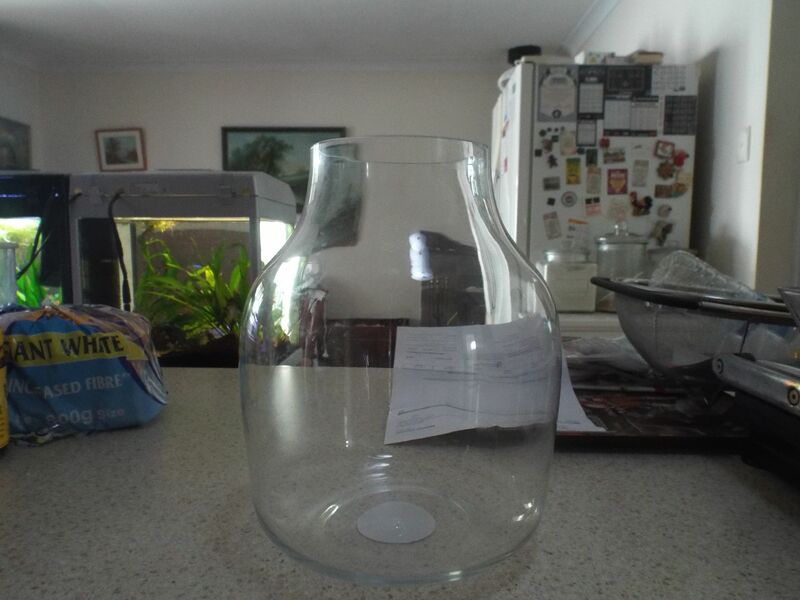 This is the first vase I am looking at doing… I’ll keep posting pictures as the build progresses. This is the first of my 28l nano tanks. 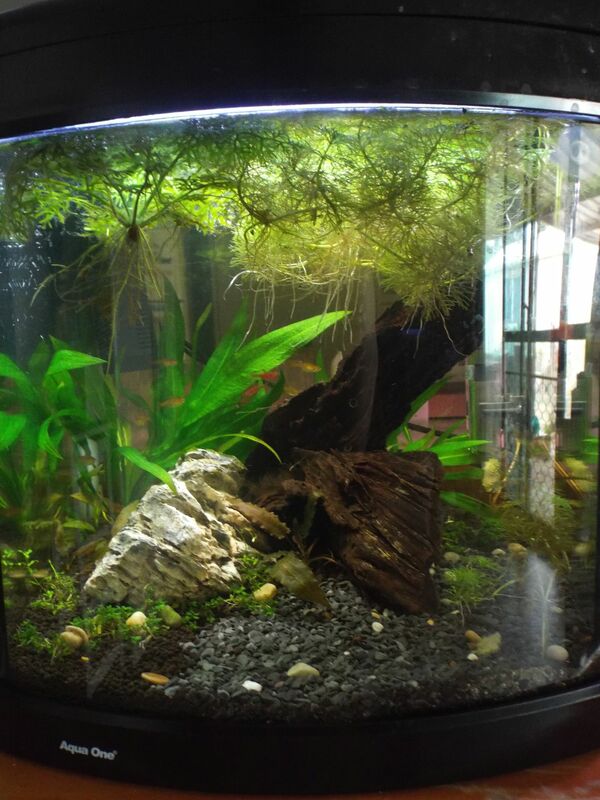 It houses one of my betta’s and also has 10 Neon Tetra’s and 3 Kuhli Loaches in it. It has Iwagumi rocks and a piece of bogwood as the hardscape. The bogwood has Java Fern stuck to it. The back corner has a couple of clumps of swords that I took from one of my other tanks with some monte carlo in the foreground as a carpetting plant (although it isn’t carpetting all that well at the moment). It’s been going for a couple of months now and the water is that colour because of the Indian Almond leaf in it providing some tannins for the water. This tank is my other 28l nano tank and I’ve only had it up and running for a week or so. Once again, the hardscape is Iwagumi rock and 2 pieces of bogwood and a nice grey gravel section at the front left (our right) of the tank. 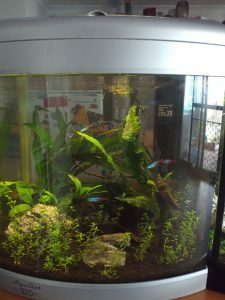 It also has a good clump of swords taken from the same tank that nano tank 1 got it from. There are also some red crypts, and some monto carlo in the foreground. The plants floating at the top are some Hornwort and some water sprite. I’ve also planted some Hornwort in the grey gravel at the front right. The fish in this tank are all nano fish. They don’t grow much larger than what you see right now. The two bright red fish in the centre of the picture are Rasbora Maculata’s and there should be 6 of them in there. The yellowy orange fish are Ember Tetra’s… and that school is about 13 fish. There are also a couple of pygmy corydorus and 3 otocinculas. If you are thinking to yourself that the tank is well overstocked, remember that the rasbora’s will only grow to 2cm’s in length, the ember tetra’s about the same… and the pygmy corys are the same again. The oto’s are the biggest fish in there at about 3cm in length. And as the plants grow in, and the roots from the floating plants grow down, there is going to be that many hiding places for the fish, they will never feel crowded in there. As for keeping the water clean, nano tank 1’s filter pushes through 150l/hour while nano tank 2’s filter does approximately 250l/hour, although I have it turned right down so it’s probably doing around 125l/hour. So both filters are cycling the water in the tanks at least 5 times/hour. 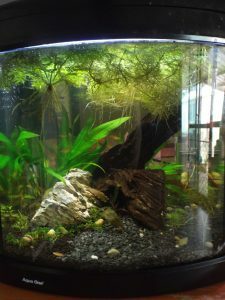 I think in my next post, I will talk about my 105l tank.